Today we'll be exploring 'Bunraku' said Oli. I beg your pardon said I! 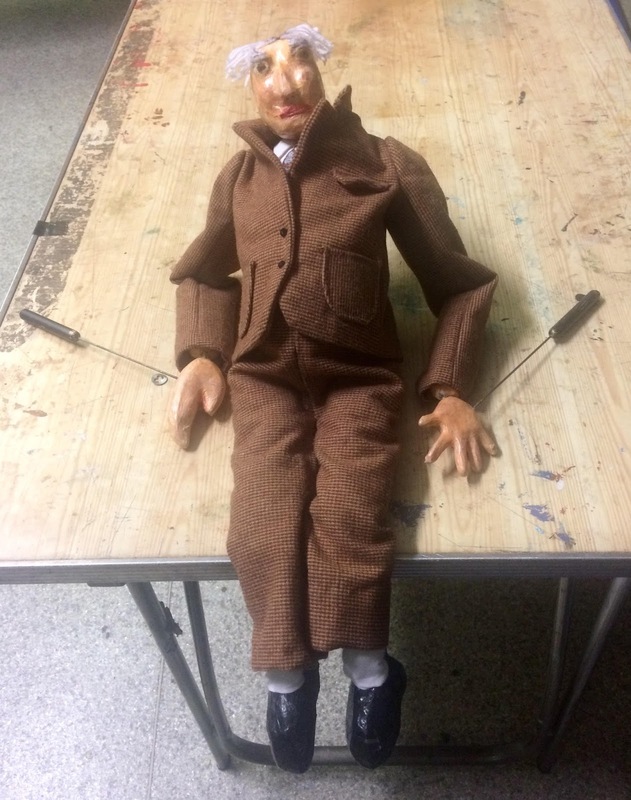 Each puppet requires 3 operators: one on the head and an arm, another on the lower torso and the other arm, and finally one on the feet. The person operating the head is the lead puppeteer as the head will usually guide a movement - we'll look at something before we walk towards it for example. 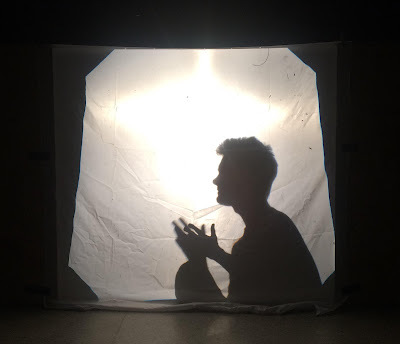 The head operator will also initiate the process of syncing the breathing of the puppeteers so that the puppet 'breathes' with a unified breath. It's quite fascinating to watch - when the puppeteers breathe together, even if the puppet is doing nothing it appears to breathe itself - it looks like it's living; as if it's alive! We split into groups of 3 and each group was given a Banraku puppet to play with and a table to work on, although these puppets are usually free floating (the ground on which they walk on etc. is ordinarily defined by the puppeteers imaginations). We each got to have a go controlling different parts of the puppet. 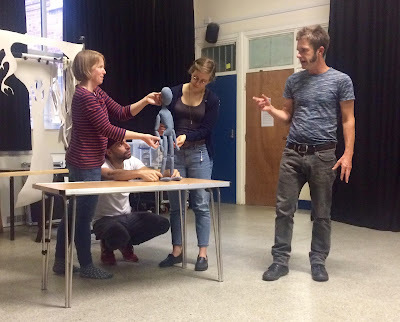 When on the head it became clear that you had to communicate strong ideas and loud thoughts in order to guide the other puppeteers, but also so the audience knew what the puppet's intention was. 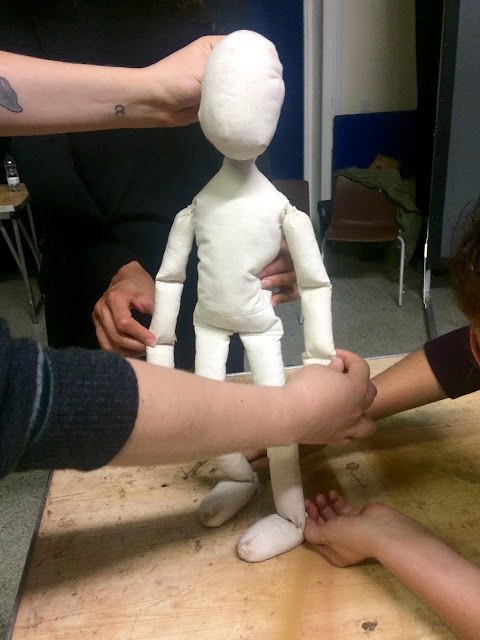 If the puppet saw something at a corner of the table for example, it had to exhibit a definitive look towards it and show clear intention in order to follow through with the movement in walking towards it. 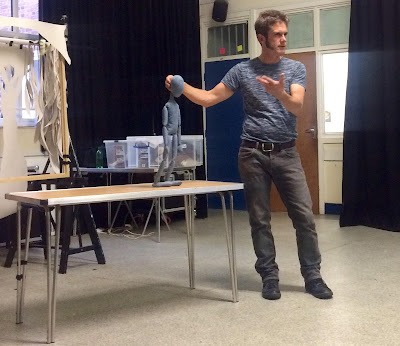 The audience might also get a feel for the puppet's attitude to whatever it sees - is it walking towards it quickly or slowly, is it confident or bashful, determined or care-free? For example, we found a piece of cardboard on the corner of our table that our puppet really wanted. After he tried to pick it up, it dropped onto the floor, so our puppet climbed off the table to go and get it! Eventually, after struggling to pick it up again, he pushed it away in a dismissive gesture. 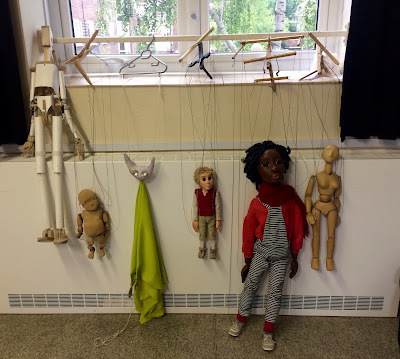 Working with these types of puppets really challenges you to look closely at your own movements. Oli gave instructions for the movements of the puppets like: sit down and stand up again, jump in the air, do a backward flip etc. In order to realistically portray this we had to try the movements out ourselves - there was a lot of sitting down and standing up and jumping around going on in the room. I draw the line at the backward flip! 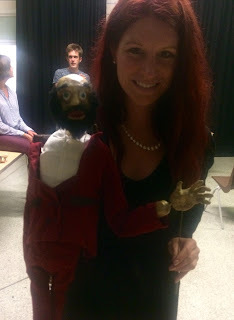 We also got the chance to try things out with some more characterful, wooden puppets of the same style. Here's some examples (below).